In 1797 the Treaty of Tripoli was ratified (Article 11 of the Treaty reads in part: “…the Government of the United States of America is not, in any sense, founded on the Christian religion…”). Article VI, Sect.2 of the Constitution states that “all treaties made, or which shall be made, under the authority of the United States, shall be the supreme law of the land.” The Treaty was ratified unanimously and the full text was published in The Philadelphia Gazette on June 17th, 1797, without any record of any public dissent. During the Civil War Era, eleven Protestant denominations began a campaign to add references to God to the U.S. Constitution and other federal documents. Their efforts resulted in the phrase “In God We Trust” being added to some Union coins. In 1788, the United States Constitution was ratified, replacing the Articles of Confederation, and in 1789, the United States of America was born. The Constitution significantly did not establish religion. The establishment of a secular government, based on Enlightenment Principles of Reason, was unique in the history of the world. It was a new day dawning. No longer would a king or church rule over the minds and bodies of the People by a claim of divine right. He was right to be worried…. In 1956, during the McCarthy era and Cold War “red scare” of communism, Congress passed a joint resolution making “In God We Trust” our National Motto. 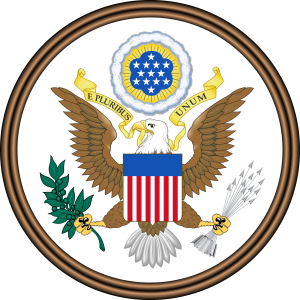 This replaced our former de facto National Motto, the Motto our Founders gave us, “E Pluribus Unum (Out of Many, One).” Two years earlier, the words “under God” had been inserted in between “one nation” and “indivisible” in the Pledge of Allegiance making those words into a lie. Both the Motto and Pledge were originally secular and all-inclusive, now they were both made religious and exclusive. In each case, these actions excluded anyone who didn’t believe in a monotheistic God, making them feel like second-class citizens in their own country. Sadly, North Carolina takes this discrimination further. The North Carolina state constitution bars state office to “any person who shall deny the being of Almighty God.” This prohibition is ranked first, even above treason, in the state constitution (see: Article VI, Sec. 8. Disqualification for office). In 1961, the United States Supreme Court ruled unanimously that such restrictions constituted a religious test incompatible with the First and Fourteenth Amendment protections (see: Toraso v.Watkins) and are therefore unenforceable. Nevertheless, North Carolina, Maryland, Massachusetts, Pennsylvania, South Carolina, Tennessee, and Texas retain restrictive religious requirements in their Bill of Rights, Declaration of Rights, or in their constitutions. The problem with having such restrictions in the state constitution can be illustrated by the example of self-described “post theist” Cecil Bothwell. In 2009, Bothwell won the election for a position on the city council in Asheville, NC. He was challenged by his opponents on the basis that North Carolina law does not allow atheists to hold public office. Regardless of the fact the challenge was ultimately ineffective and irrelevant, based on federal law, it was still used as fodder against him and can be used against him in the future when he runs again. It can also be used against any other nonbeliever who might desire to run for office, intimidating them from running. The net result is: nonbelievers without adequate representation. Some might argue that issues like these are holdovers from the past. Unfortunately, and most disturbingly, North Carolina’s current representatives on the state level seem intent on further flouting federal law and the U.S. Constitution. For example, over the past couple of years they have been starting sessions with clearly sectarian prayers. In 2012, North Carolina politicians crafted and passed a law that restricted marriage to one man and one woman, based solely on religious ideas. In 2013, they have passed a bill, and the Governor has signed it, that restricts a woman’s constitutionally protected right to control her own reproductive system. Earlier in this last session, some attempted to have Christian Bible study included in public education and to even establish religion. This flouting of federal law and the U.S. Constitution is not limited to the state level. There are other examples in cities and counties across the state, of sectarian invocations being sanctioned by government representatives. Two recent examples come from Forsyth and Rowan Counties, where their respective City Councils were sanctioning clearly sectarian prayers before their meetings. In both cases, legal action was required to bring a halt to it. This was costly for taxpayers and created dissension in the communities that were affected. While not as blatant, even the Charlotte City Council seems to push the boundaries of the law as far as possible with their invocations and they will dance over the line on occasion. They are certainly intentionally violating the spirit of the law, if not the letter. It is likely this kind of thing is happening in other city councils and public schools across the state. In fact, there seems to be a concerted attempt to undermine and destroy the public school system. The North Carolina Legislator has passed a tax bill that applies to every school district in the State of North Carolina and which will allow for transferring money, our taxes, from the public school budget to fund vouchers which may be used at religious, as well as Charter schools. There are even those hoping to subvert the public school system by engaging in a campaign to “implant after-school ‘Good News Clubs’ in every public elementary school in the United States.” Mathew Staver–President of Liberty Counsel and leader of the Child Evangelism Fellowship initiative–wrote that Good News Clubs are a “high-powered Sunday school which can now be established in the public schools immediately after school.” The Child Evangelism Fellowship now has Good News Clubs operating in public school systems in all 50 states, and there are currently at least three Good News Clubs operating in North Carolina. Two are located in Fuquay Varina and one in Indian Trail. James Madison’s warning about “the danger of encroachment” should never be taken lightly. In the past several decades, religious fundamentalists have launched a concerted effort to revise history to suggest that this country was founded on Judeo-Christian principles despite the clear evidence to the contrary. In order to do this, they have propagated false, altered, or out-of-context quotes from founders to further their agenda and to rewrite history wherever and however they can. Many of them seem intent on establishing their religion by whatever means necessary, even if they have to lie and deceive to accomplish their objectives. They seem to be willing and able to dispense with their own prime directive of doing unto others as they would have done unto them in order to accomplish their goals. They are a clear and present danger to our democratic republic, to freedom of conscience, and to our country’s founding ideals of equality, liberty, and justice for all. As many others have said before, “Eternal vigilance is the price of liberty.” This is certainly the case here. We need to keep ourselves informed about the actions of individuals, groups and politicians who attempt, by whatever means, to break down the wall between church and state. We need to draw attention to it when we see it happening, and we need to act–and to encourage others to act–to stop it. We can act by speaking out against it, by organizing protests, by exercising our right to vote, and, where appropriate and possible, to take legal action to mitigate and remove these activities. The encroachment of religion into government is a threat to everyone’s civil rights. It isn’t just a threat to the irreligious; it’s a threat to everyone. Note that our founders weren’t just concerned that religion might corrupt government, but they were also concerned that government might corrupt religion. What is ultimately corrupted is the freedom of conscience and civil rights of the individual. Published in the Raleigh News & Observer as an OpEd. The Secular Coalition for North Carolina is extremely concerned about the recently proposed Senate Bill 138 offering students in grades 9-12 elective courses in Bible studies. We believe this bill is problematic for many reasons, that it will likely not be implemented as intended, that the costs of adequate implementation have not been addressed, and that the end result will be a failed program which will put our school districts in legal jeopardy and North Carolina taxpayers in financial jeopardy. We would like to point out that Bill SB 138 does absolutely nothing to make sure that teachers receive adequate training to teach these courses in such a way so as to ensure that constitutional guidelines are followed and the religious freedom of students is protected. We contend that the failure to address this issue in the bill is highly irresponsible and short-sighted, inviting the kind of problems now being experienced in Texas, and will set the stage for numerous future legal battles to be fought out on the local level when inadequately trained teachers fail to follow the constitutional guidelines. We believe that our public schools at the high school level are not currently equipped to ensure these classes are taught as intended, that the resulting legal battles will be costly to the local communities across the state, and that the cost to hire or prepare teachers and create the curriculum to ensure the classes meet constitutional muster is prohibitive in the current economic climate. Finally, we object to the favoritism of the Christian religion inherent in the bill. We question why the legislature would propose elective courses in the “holy” book of one religion and not any other. We feel this is discriminatory on its face and question the intentions and motivations of those proposing and supporting the bill. In sum, we strongly object to and oppose this bill. We suggest that colleges are better suited and equipped to teach classes in religious studies, and that free Bible study classes are already available for those interested in the abundance of Christian churches across the state.